Ronald Acuña Jr. is not going anywhere. The reigning National League Rookie of the Year and the Atlanta Braves have agreed to an eight-year, $100 million extension with two club options, the team announced on Tuesday afternoon. The maximum value of the contract could rise to $124 million if the team picks up the $17 million options for the 2027 and 2028 seasons. The deal also includes a $10 million buyout. The contract is the second-largest deal handed down in franchise history behind only star first baseman Freddie Freeman’s eight-year, $135 million extension in 2014. Locking up one of the sport’s brightest young stars throughout his 20s — especially with the bargain-basement cost of the two club options as MLB revenues continue to skyrocket, not to mention adjustments for inflation — at essentially $12.4 million annually should be considered nothing short of a coup for Atlanta’s front office. In an offseason where front offices have now committed more than $4 billion in extensions, Acuña might be the steal of group. At 21 years old, Acuña is the youngest player to ever sign a contract worth at least $100 million guaranteed. Ronald Acuña Jr. will be the youngest player in baseball history to sign a contract worth $100M+ guaranteed. The contract does not include opt-out clauses, performance-based bonuses or a no-trade clause. The Venezuelan product altered the franchise’s fortunes almost immediately upon arrival during the 2018 season, spearheading the second-half push to the organization’s first National League East championship since 2013. 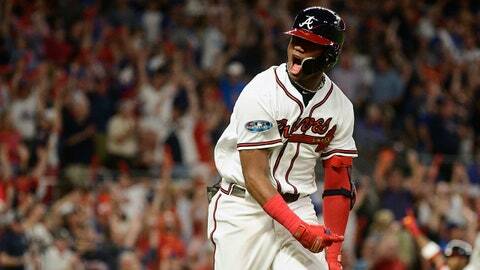 Acuña slashed .293/.366/.552 en route to posting 3.7 wins above replacement as a 20-year-old — one of only 12 players to ever hit 40 percent above league average (minimum of 250 plate appearances) before turning 21 years old. Acuña, who is represented by Gamemore Sports, joins Freddie Freeman and Ender Inciarte as the only Braves players guaranteed non-buyout contracts after the 2019 season, though the team is stocked with young, controllable standouts and top prospects capable of contributing to contending well into the next decade.